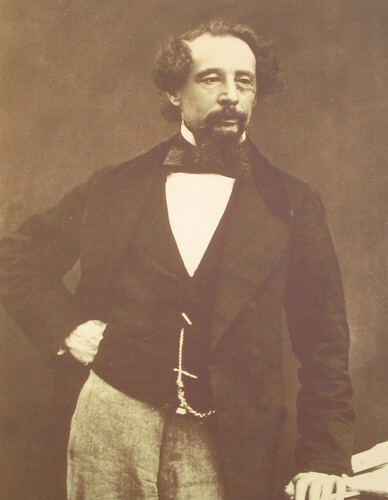 Two hundred and one years ago today, English writer Charles Dickens was born. The prolific author’s inventive character names have given rise to many words now common in the English language, and he has been credited with the coining of dozens of words. While some of these words have been antedated – for example, an earlier citation of boredom, long credited to Dickens, has been found – there’s no denying the author’s role popularizing words that may have disappeared into obscurity. Today we round up 11 of our favorites. You may be surprised to know the modern-sound phrase, the creeps, “a feeling of fear and revulsion,” was coined by Dickens. He may have been influenced by the sense creepy, “chilled and crawling, as with horror or fear,” which originated around 1831. Gonoph is slang for a pickpocket or thief. The word comes from gannabh, the Hebrew word for “thief.” Dickens’s seems to be the earliest recorded usage of the word in English. Gorm is “a vulgar substitute for (God) damn,” according to the OED. In the television show, Firefly, gorram is a common expletive, presumably a corruption of goddamn. Whether or not the show’s creators were influenced by Dickens is unknown. Lummy is slang for “knowing; cute,” or “first-rate,” and probably comes from lumme, a corruption of “(Lord) love me,” according to the OED. Lummy is another Dickens-coined word that has fallen into obscurity, though we would like to see it make a comeback. A red tapeworm is, according to the OED, “a person who adheres excessively to official rules and formalities.” The phrase plays off red tape and tapeworm, and was coined by Dickens in Household Words, a weekly magazine he edited. Red tape, slang for “the collection or sequence of forms and procedures required to gain bureaucratic approval for something, especially when oppressively complex and time-consuming,” comes from the English practice of using red or pink tape to tie official documents. The figurative sense arose around 1736, says the OED. A tapeworm is a ribbonlike parasite. Sawbones is slang for a surgeon or doctor. Before the advent of anesthesia in 1846, speed was of the essence for surgeons. With a saw like the one pictured in this article, Victorian physicians could amputate a leg in half a minute. Whiz-bang in this example means something “very rapid and eventful; rushed,” and is imitative of something that moves quickly, or whizzes, and perhaps lands with a bang. During World War I, whiz-bang came to refer to “the shell of a small-calibre high-velocity German gun, so called from the noise it made,” according to the OED. By 1916, the term referred to “a resounding success,” and in 1960, a type of firecracker. This entry was posted in authors, Word Soup and tagged charles dickens. Bookmark the permalink. I assume Gorm has some relation to gormless, used to describe someone as pathetic. Also, I believe “On the rampage” means alert and ready, if not looking for battle as a soldier would have needed to be on the ramparts of a castle he was defending. Lumme was used as an expletive like Blimey, indicating surprise and perhaps concern.